There are many slots players, who really want to win. Some people follow weird strategies, some just hope for luck and some decide not to waste time on waiting for destiny to knock their door. They start participating in the slots tournaments. It is not only a chance to win some cash but it is also much fun you can get. Why the slot tournaments are so popular? The reason is that they are very easy to participate in. There are no special requirements for the people. And you don't have to be extra-skilled and that is what makes them so attractive for the players. Once the player signs up for any type of the slot tournament, he will be given the machine number and time, when he is supposed to play. When the time comes, all the players take their seats and just play. All of them are given a certain amount of the credits and they should be played for a limited period of time. In general, people play for twenty minutes and they have 1000 credits each. If you start winning, all your winning credits will be displayed on a separate meter. If it happens that you won't play all the credits you were given in the beginning, you will lose all of them. The winner is determined according to comparison of the winning credits of the players. When you run out of time, you should just stay at your machine until some person will come to write down your scores. There are freerolls, invitation and guaranteed tournaments. They are usually made for the patrons and high rollers, who are willing to spend money at the casino. And they are not accessible for general public. But there are tournaments, which are designed for the simple mortals. 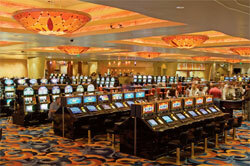 In the land-based casinos it is a wonderful chance to gamble for free and win some prize. What can be better? If you don't win, so don't be sad as you did not play for your own money. One of the best types is that you can get your entrance fee back. It is also much fun, as no matter how much you lose or win, you will be given all your buy-in money back. You should take advantage of all of them.